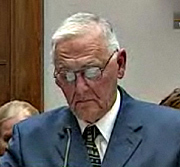 Jack DeCoster during 2010 testimony before a House committee. A sentencing hearing is underway today in Sioux City for Jack DeCoster and his son, Peter for their pleas in the case involving the conditions at an Iowa egg laying facility that led to a massive salmonella outbreak in 2010. Governor Terry Branstad commented on the issue during his weekly news conference in Des Moines. “They’ve done some very bad things,” Branstad said. “They’ve been convicted of doing some things that actually led to the death of some people from salmonella and there’s really no excuse for that. I believe it is appropriate that they be held accountable for their actions.” Nearly two-thousand people were sickened in the outbreak linked to Quality Egg, based in Wright County. Fifty-one-year-old Peter DeCoster of Clarion, Iowa, and his 80-year-old father, who lives in Maine, pleaded guilty last June to misbranding eggs to make them appear fresher and to bribing public officials. Inspectors found unsanitary conditions at DeCoster’s facilities in Iowa and the DeCosters have pleaded guilty to introducing adulterated food into the marketplace. When Jack DeCoster first arrived in Iowa, he established large-scale pork production facilities and Branstad’s past political opponents over the decades have accused him of “welcoming” DeCoster to Iowa in 1987. The DeCosters have gotten out of the egg business. Fifteen years ago DeCoster was named the first “habitual violator” of Iowa environmental laws. The sentencing hearing began this morning in Sioux City, and it is unclear how long it may take before it is completed.